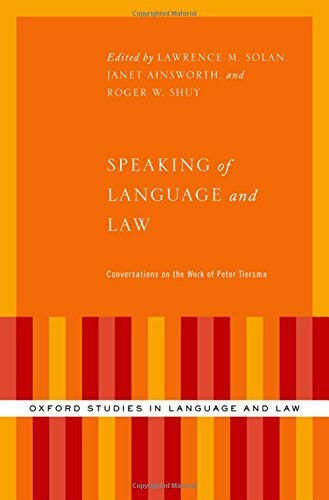 Among the most prominent scholars of language and law is Peter Tiersma, a law professor at Loyola Law School with a doctorate in linguistics (co-editor of The Oxford Handbook of Language and Law). Tiersma's significant body of work traverses a variety of legal and linguistic fields. This book offers a selection of twelve of Tiersma's most influential publications, divided into five thematic areas that are critical to both law and linguistics: Language and Law as a Field of Inquiry, Legal Language and its History, Language and Civil Liability, Language and Criminal Justice, and Jury Instructions. Each paper is accompanied by a brief commentary from a leading scholar in the field, offering a substantive conversation about the ramifications of Tiersma's work and the disagreements that have often surrounded it.